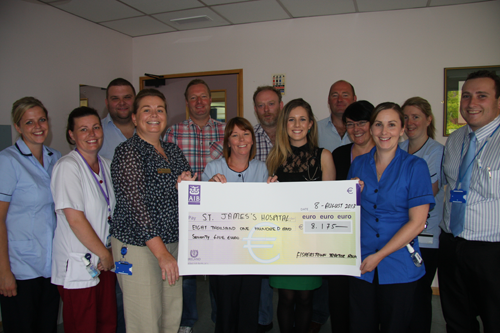 The staff of St John’s Ward were delighted to receive a visit from four friends from Co Laois who brought them a gift of €8,175. From Fisherstown, Peter and Tommy Corcoran, David O’Connell and Willie Walsh came to St. James’s to present the proceeds of their fifth annual Fisherstown Tractor Run; the donation represented entry fees for 123 tractors and sponsorship raised that will be used for the benefit of head and neck cancer patients. The 20 mile tractor tour, which started and finished at The Fisherman’s Thatch Inn in Fisherstown, took place in the glorious sunshine of Sunday, July 7th. St. James’s Hospital caters to patients with all forms of cancer and is the largest single provider of cancer treatment in Ireland and the largest national centre for radiotherapy service. A major new government funded Cancer Care Centre and Radiation Oncology Centre is now open on the site and the facility for PET imaging for advanced patient diagnosis is the only such facility within a public hospital in the country. Head and neck cancer patients are attended on St. John’s ward; it is a 31-bedded ward whose ethos is to provide holistic patient care, with strong multi disciplinary teamwork.